Markets have inefficiencies, because of their inability to correct the negative externalities of industrial outputs (production) and industrial inputs (depletion of non-renewable resources). Failure to calculate the costs to nonparticipants in transactions and failure to allocate resources efficiently, represent market failure definitions. Externalities represent cases of market failures. A person (or company) who makes choices that affect other people not accounted for in the market price – like the pollution costs often unaccounted for in industrial greenhouse gas emissions- is creating an externality. Excessive costs of excluding potential beneficiaries from the consumption of a rival natural or human-made resource, represent an inefficient market allocation - non excludability. Hence, "common" goods are defined by a property right regime in which only a collective body could exclude others from accessing rival resources, thereby allowing the capture of future benefits. Stable “common property” regimes – suitable to the local level - must be based on certain principles which prevent the overexploitation of a resource system. However, these regimes are not the solution to large scale overuse , such as air pollution. In those situations, environmental regulations (economic impact estimated by cost-benefit analysis), quotas on pollution (tradeable emissions permits), taxes on pollution and adequate definition of property rights, might be preventive solutions to correct negative externalities. Public goods are another type of market failure, because the market price doesn’t catch the social benefits of public provisions. For example, both social protection and environmental protection are inherently public goods, since their provision, in case of non-congestion, is non-rival and non-excludable, either protecting people from the risks of unemployment and illness or from environmental risks, like climate change. If a public service faces problems of congestion or overuse, it will be a non-excludable but certainly a rivalrous good, making it a “common-pool resource”. Privatization of public goods doesn’t change their intrinsic non-excludable, social and environmental characteristics. Nobody has the right to exclude people from protection, i.e., to prevent people who have not paid for the service, from receive its benefits .Most of public goods, like most of non-rival goods , are intangible, less fitted for an efficient private market. Scarce, rivalrous, but also vital resources (like water) cannot be excludable. Water priced on a private market it would be the receipt to a humanitarian disaster, as the recent global market failures may prove. With respect to local public services provision, the Finnish health care system is one of the most decentralized in Europe (as well as the other Nordic countries), with most of the Finnish people being generally satisfied with their national health care system. Local municipalities (Finnish: kunta) are the center of the system, largely public, where the private sector has little relevance today (only about 4% of Finnish doctors have a purely private activity) and the state has little intervention, defining goals and orientations. However, although the public health care and education, Finland has an advanced and competitive market economy. The view considering that markets are unable to correct negative externalities is in contradiction with the free-market environmentalist perspective. This perspective considers that both lack of ownership incentives to care for the property and multiplicity of ownership, represent the cause of overexploitation. In this point of view, pollution occurs because the property owners’ rights have not been totally respected and the legal authorities have inclination to favor big industry, public and common property over individuals and consumer organizations. That approach also argue that resources are renewable and the market, by way of supply and demand, regulates consumption by adjusting it according to supply.The absence of sufficient incentives to create a potential “market” in a private economy, causes loss of efficiency, according to this view. These previous considerations are also appropriated for the financial markets, specially for institutions which utilize them. The recent dramatic intervention of the Federal Reserve, aimed at bailing out Wall Street with a US$700 billion plan, was a spectacular representation of market failure. In fact, the market took multiple decisions that would affect millions of tax-payers, who weren’t accounted for in the finance market price. The actual "turbo-capitalist" crisis, whose end and global consequences are unpredictable, could constitute an opportunity to the construction of a new alternative economic model firmly based on the environmental, economic and social domains, with new concepts of “growth” - not just a “green“ recovery based on this capitalist model, but a effective Low-Carbon Economy model. However, a future green recovery may be compromised. The actual situation of financial collapse, with the state injecting hundreds of billions in the financial capitalist system, doesn’t assure the future application of funds on the environmental and social areas. It may even deflect these funds from many necessary and urgent investments in those areas. Past Friday, 3 October 2008, the US House of Representatives voted in favour of a financial rescue plan after rejecting an earlier version. The approved package is aimed at buying up the bad debts of failing financial institutions on Wall Street, having the Treasury $700 billion to buy “toxic” mortgages, securities and related assets, that have undermined the US financial structure. But the deep causes of the US financial market collapse still continue unknown, and therefore this massive intervention probably cannot reach them. So far “toxic” products are the justification for the financial market failure. However, financial products are increasingly designed trough technological innovation, which has replaced experienced professional traders by computers running software based on algorithmic trading, trying to simulate human behavior, deciding on timing, price and the final quantity of the orders. Although many claim an increased market efficiency with “robo trading” the last events could contradict it, and thus we could be in presence of a global technological (in)adaptation. 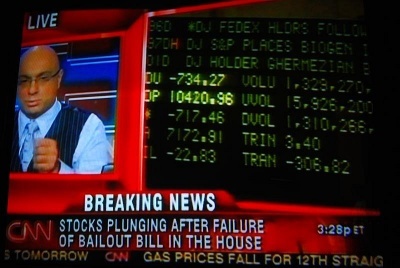 On September 29 2008, the Dow Jones lost 777.68 points, the largest one day point loss in its history, following news that the US House of Representatives had failed to pass the $700 bn bailout bill. Only after the Monday's 777-point stock-market slump the political class started to see the extension and deepness of the crisis. The “shock” and the claims from worried November potential voters motivated the Friday morning vote change. The bill that establishes the Emergency Economic Stabilization Act of 2008 - previously approved by the Senate, on October 1 2008 - was sent to the House, and on Friday, October 3, the House voted 263-171 to enact the bill into law. Ah, the market that corrects itself; the best of all possible financial systems, etc. etc. It sounds as some sort of Platonic demiurge that keeps the universe in harmony... But there is a component which we leave out at the risk of our very humanity: and that is greed! Plato actually said it best when he warned us that poverty has little to do with how much or how little we possess but with how big our desires are. And Aristotle taught us to distinguish between needs and wants. What Madison Avenue does is to turn our wants into needs so that our very self is defined as nothing else but "what we owe" and our society becomes the "ownership society" of George Bush. What did Plato and Aristotle know about the market will exclaim the cultural philistine and the barbarian of the intellect. Not much to be sure, but they did seem to know a thing or two about human nature. We still have plenty to learn from them. We have plenty to learn from them, but we have a different context now, and much more knowledge that we simply cannot ignore. At a given point, or different points in time, we invented chimneys, glasses, brakes, and it would be silly not to use them today. What a terrible mess this has become! An election in a month, and some very scarey times. So much needs fixing from the economy to energy and sustainability an so much more. I just hope whoever is elected will roll up their sleeves and get down to business! Considering the voting records of both Obama and McCain and the overwhelming power to corrupt of corporations and the financial sector it is unlikely anything sensible or even reasonable will occur. Well, one of the worst days in 30 years for stock markets worldwide today, and I'm drawing the "stock markets fall".